FILE - Turkey's President Recep Tayyip Erdogan speaks at a joint media briefing with Indonesia's President Joko Widodo at the presidential palace in Jakarta, Indonesia, July 31, 2015. Talks to form a coalition government in Turkey appear to be making little progress and a snap parliamentary election looks increasingly likely amid claims by opposition politicians that President Recep Tayyip Erdoğan is determined to conduct a new poll against the backdrop of rising political violence. 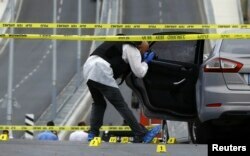 In the past two days, a series of attacks – including assailants opening fire on the U.S. consulate in Istanbul and an overnight car bombing Sunday a few districts away – have heightened fears that Turkey is being pulled remorselessly into a spiral of violence just weeks after the government launched what it describes as a "synchronized war on terror." Some recent surveys indicate the ruling Justice and Development Party (AKP) may improve marginally its share of the vote and be able to form once again a single-party government again after a new election. In June the AKP lost its parliamentary majority, thanks partly to a strong performance by a pro-Kurdish party. But ruling AKP officials told VOA that polling by the party so far is showing only minor public opinion movements. Thirty days remain for coalition negotiations under the country’s constitution, and leaders of the social democratic Republican People’s Party (CHP) accuse Erdoğan of playing for time. 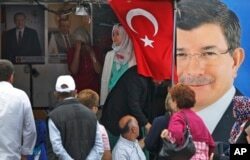 FILE - People walk past a poster of Turkey's Prime Minister and leader of the Justice and Development Party (AKP) Ahmet Davutoglu (R) in Istanbul, Turkey, June 5, 2015. They charge he is publicly encouraging his caretaker, Prime Minister Ahmet Davutoğlu, in the search for a parliamentary partner for the AKP while preparing for a snap election amid security fears and escalating violence. They accuse the AKP government of fueling the violence with a heavy-handed security approach in order to whip up nationalist fervor – a charge denied by officials. On Sunday, Davutoğlu called on all political parties to take a common stance in the face of shootings and bombings. “I call on all political party leaders to embrace public order, democracy and take a common stance on the issue of laying down arms,” the prime minister said on his Twitter account. But in response, Selahattin Demirtas, leader of the pro-Kurdish People’s Democratic Party, criticized the government for its ongoing anti-terror campaign. He claims the AKP is seeking political gain by creating a perception the country is under existential threat. “Peace is urgent. Mr. Davutoğlu, we are not requesting this from you. You are obliged to do it,” he said in comments addressed to the prime minister. With a two-year cease-fire between Ankara and the outlawed Kurdistan Workers’ Party (PKK) now in tatters, Kurdish separatists are increasing attacks on Turkish security personnel. FILE - Greeted by supporters, Selahattin Demirtas, leader of pro-Kurdish Peoples' Democracy Party, smiles as he arrives at his party headquarters in Ankara, Turkey, June 9, 2015. Four policemen were killed and a fifth seriously wounded Monday in a roadside bombing in southeast Turkey. Three policemen died over the weekend in two separate PKK attacks in the southeastern provinces of Şırnak and Mardin. Another police officer died from injuries he sustained when his unit was attacked by a group of militants linked to the PKK in the town of Silopi. And PKK militants opened fire on a military helicopter in Şırnak province, killing one soldier, bringing the death toll among security forces in the past month from PKK bombings and shootings to more than 30, according to a tally by the state-run Anadolu Agency. The violence has spread to Istanbul. At the weekend, unidentified gunmen opened fire at the headquarters of the Justice and Development Party (AKP), wounding a civilian. A police station was car-bombed in the Istanbul district of Sultanbeyli overnight Sunday wounding seven civilians, two policemen and a deputy police chief, according to a statement by the Istanbul Police Department. A police investigator takes pictures of a vehicle after an attack on a police station in Istanbul, Turkey, Aug.10, 2015. Broadcaster CNN Turk reported two gunmen and a bomb disposal officer were killed in a firefight that extended into Monday morning after the bombing. While the violence in southeast Turkey is mainly being perpetuated by the PKK, up north the allegiance of assailants remains unclear. Turkish intelligence officials told VOA the shooting at the U.S. consulate was likely the work of the far-leftist Revolutionary People's Liberation Army-Front (DHKP-C). Dozens of the groups’ members are among hundreds of political activists detained in recent weeks. The PKK announced that it was intensifying attacks in mid-July over what it said were violations by Turkish security forces of a 2013 cease-fire. The violence worsened dramatically after a deadly jihadist bombing in the southeastern mainly Kurdish town of Suruç on July 20. The PKK alleges Turkish authorities have colluded with jihadists – an allegation firmly denied by Ankara. Following the upsurge in PKK violence, Turkey launched airstrikes against PKK bases as it announced it would take a more forthright role in the U.S.-led coalition against Islamic State extremists as Washington has urged since last year. 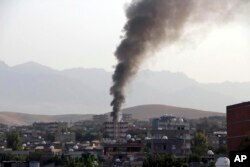 But most Turkish military action has been focused on Kurdish separatists. “The fight against the PKK took the limelight, giving the impression that Turkey’s new stance against IS [Islamic State] was nothing more than a smokescreen for an all-out war against the PKK,” argues newspaper columnist Cengiz Candar. FILE - Smoke billows from a fire during firefight between the police and Kurdistan Workers' Party, or PKK militants in the town of Silopi, southeastern Turkey, July 7, 2015. Kurdish leaders think the Turkish government’s fight against the Islamic extremists is “actually a proxy war waged against them by the Turkish government, who they accuse of aiding and supporting IS,” he adds. Last week, while acknowledging Turkey has the right to defend itself from Kurdish separatists, U.S. President Barack Obama warned the Turkish government that the war against the Islamic State group in Syria should take priority. He said Turkish action must be “carefully bound” so as not to go on the offensive against the PKK, which is allied to Syrian Kurdish fighters who have proven to be reliable allies for the international coalition in the fight against the Islamic State group, also known as ISIL or ISIS. Both the U.S. and Turkey consider the PKK a terrorist organization. Germany’s top diplomat, Frank-Walter Steinmeier, told a German daily newspaper Sunday that the renewed armed clashes between the Turks and Kurds could lead to disastrous consequences for the entire region.